JACKSON, Miss. 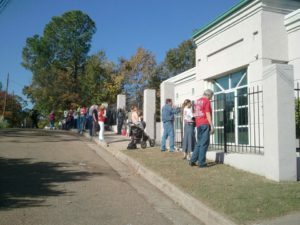 — A pro-life legal organization has filed a federal lawsuit against a police department in Mississippi for violating the civil rights of Christians who conduct pro-life ministry outside of the last remaining abortion facility in the state. “The Jackson Police Department has routinely harassed pro-life citizens, who have been peacefully exercising their legal right to oppose abortion in the public square and offer information about life-affirming alternatives to women seeking abortion,” stated foundation President Dana Cody. The case centers on threats and arrests over the past year at Jackson Women’s Health Organization, the last remaining abortion facility in the state. As previously reported, Cal Zastrow, one of the Christians named in the suit, told Christian News Network last year that he believed the Jackson Police Department has been trying every avenue possible to force Christians who conduct outreach at the facility to leave. “[B]asically, the police have gone overly aggressive with arresting people in trying to intimidate us to get off the streets,” he said. Zastrow was arrested twice in 2013 for allowing his pro-life sign to touch the ground and was charged with obstructing a public sidewalk. He states that there is no law prohibiting people from allowing hand-held signs from being on the ground. Ester Mann, a pro-life grandmother, was likewise arrested last year for letting her sign rest on the public sidewalk, as well as John Breeken, who was taken into custody for the same alleged offense. Mann and Ron Nederhoed were again arrested later that year for sitting in a lawn chair on the sidewalk while holding pro-life signs. Earlier this year, Doug Lane was detained by Jackson police after being accused of preaching too loudly, and Roy McMillan was ordered to remain in his vehicle when he was found to be distributing pro-life literature on the public sidewalk. Last week, the Ohio-based group Created Equal conducted an awareness campaign outside of Jackson Women’s Health Organization, and when a nearby business owner began stealing the signs and placing them in his basement, the Jackson Police Department did not act. The lawsuit seeks preliminary and permanent injunctions against the Jackson Police Department, as well as damages and attorney’s fees. The City of Jackson had entered into a consent decree in 2008 not to interfere with pro-life activity at the facility; the suit alleges that the city has violated the agreement and asks the court to declare the city as being in contempt.